WILLISTON, North Dakota (Reuters) - Two energy advisers to Donald Trump want him to call out members of the Organization of the Petroleum Exporting Countries for driving down world oil prices when he delivers a major energy policy speech this week. The advisers, who said they had been asked by Trump's 2016 presidential campaign to contribute ideas for the speech, told Reuters they had also suggested he mention cuts to regulations and a streamlining of the federal tax code to make U.S. energy companies more competitive. The advisers, U.S. Congressman Kevin Cramer of North Dakota and another who asked not to be identified, said they had urged Trump to criticize the OPEC cartel for contributing to a crash in world oil prices by producing full throttle, a factor that has helped push many U.S. oil companies into bankruptcy. "We have to look at the global playing field and see which of our partners - OPEC, Iran, Russia - are playing fair in the global marketplace," Cramer said about the advice he had been giving Trump. Trump, the presumptive Republican presidential nominee, has not shied from targeting OPEC's top producer, Saudi Arabia, in the past. He has said the United States should consider halting oil purchases from the kingdom if it does not provide troops to fight Islamic State militants who control swaths of Syria and Iraq. 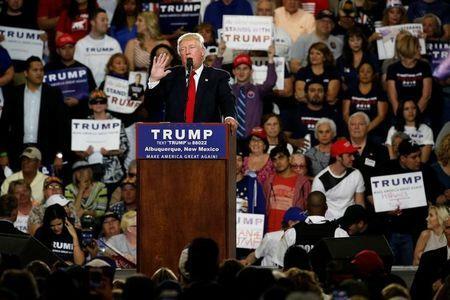 Trump's speech on Thursday at the Williston Basin Petroleum Conference in North Dakota, the heart of U.S. drilling country that has been hard hit by the oil price slump, may reveal for the first time how he will approach the energy sector if elected. A spokeswoman for Trump's campaign declined requests for comment and it was unclear whether Trump would use any the ideas provided by the advisers. Trump has so far been mostly mute on details of his energy policy. He has dismissed climate change as a hoax, promised to renegotiate the U.N. global climate accord, and vowed a revival in the U.S. coal industry, which has been hobbled by low prices and rules that limit pollution emissions. Environmental advocates and Hillary Clinton, the frontrunner for the Democratic nomination, have criticized his stance for underplaying the economic and social risks of climate change. Cramer, who cosponsored a bipartisan bill to investigate OPEC's influence in the oil market, said Trump should examine Saudi and Venezuelan ownership stakes in U.S. refineries that import foreign oil instead of using domestic supply, if he is elected president. "One-third of (U.S.) refining capacity is owned by OPEC countries. How does this fit into (Trump's) America first policy?" Cramer said. Cramer's suggestions, and those of the second adviser Reuters interviewed, have been sent to Trump senior policy advisers including John Mashburn, who is expected to help draft Trump's speech, according to sources familiar with the campaign. Mashburn could not be reached for comment. The organizer of Thursday's conference, North Dakota Petroleum Council President Ron Ness, said 7,700 people were expected to attend, many probably hoping for assurances from Trump that he will help the oil industry be more competitive. "We can manage the cyclical nature of the market but what we are struggling with is the daily onslaught of punitive regulations," he said. Cramer has suggested to Trump that he ease regulations like the Clean Power Plan, which is aimed at curbing emissions scientists believe contribute to global warming. He also wants Trump to consider the scope of waterways protected under the Clean Water Act.